Listen to the radio spot: (July 22, 2016) A new campaign has been launched by SHOESTRING (the nonprofit’s agency) and the Organization for Responsible Governance (ORG), a not-for-profit foundation dedicated to addressing long-standing issues plaguing the Bahamas. 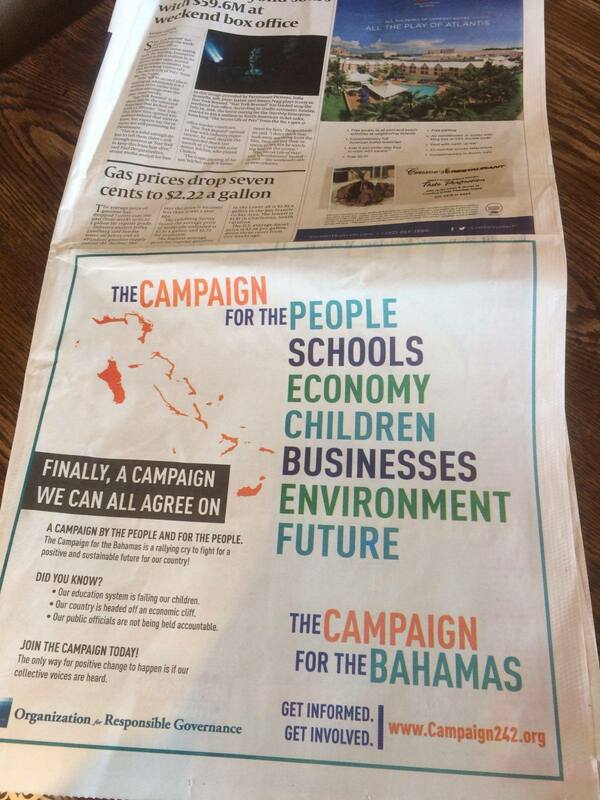 The campaign, called “The Campaign for the Bahamas,” was created for and driven by the people of the Bahamas. It focuses on a goal of bringing about positive reforms in three key areas: government accountability and transparency, education, and economic development. “The Bahamas is struggling to move forward and not enough action is being taken to turn it around,” says Dionisio D’Aguilar, ORG council member. “Disaster is looming right around the corner and something needs to be done to change, and change fast.” Motivated by this urgency, the non-political campaign is working to not only highlight the issues but also educate people and get them involved. A new website, www.campaign242.org, is a key element of the campaign and provides opportunities for learning and public participation. Social media will also be utilized to spread the word and increase knowledge of the issues. “It is necessary people to understand the issues so they can understand their importance to the future of the country and its citizens,” adds D’Aguilar. PRINT AD (CLICK TO VIEW). A prime example is good governance. The Campaign for the Bahamas is working to identify and support new legislation that will improve governance and keep the government in check. But, to engage the public in seeking reform, they must first be educated on what responsible governance means: “a government that works for the people and is accountable and transparent in its actions,” according to the campaign’s website. Current legislation being supported includes the Freedom of Information Act and the Whistleblower Act. “We need the right information and documentation from our government, ” says Robert Myers, chairman of the ORG council. “If we see something that isn’t right, we need to have the right to say something.” These new legislative reforms are intended to make the government more transparent and accountable, to benefit the people and country as a whole. “At this point in time, we have but this one chance to get the governance and management of this country right,” urges Myers. “Or it will, without a doubt, be thrust into a more desperate and unsustainable state.” Education is another of the three key issues the campaign is taking head on. According to recent statistics by the Bahamas General Certificate of Secondary Education (BGCSE) from 2012, 56 percent of students perform at a grade D level or lower. Combine that with the number of students who either dropped out or didn’t take the BGSCE, and the statistic becomes even more staggering, with 70 percent of young people undereducated and therefore unable to pursue gainful employment or a college education. Statistics show that there has been no improvement in the country’s education system in the last 35 years. Education has a direct impact on the campaign’s third area of focus, the economy. The Bahamas’ undereducated populace is wreaking havoc on the country’s socioeconomic development, Gross Domestic Product (GDP) and citizenry, Myers explains. “Quality education is critical to develop a more informed public who can access good jobs with livable wage employment and contribute back to the country’s economy.” The state of economy in the Bahamas has been on a downward spiral, which is why the campaign is focused on creating change by empowering the public to demand action. A poorly educated workforce is only one factor. A major obstacle to change is how challenging it is to start and operate a business in the Bahamas. In fact, the country ranks tragically low in the global “ease of doing business” scoring index. “The Campaign for the Bahamas is about effecting positive chance in these critical areas,” says Myers. “But we cannot do this alone. This is a fight we all must take on. We need family, friends and neighbors to lend their voices and support to this effort. We need civil society, corporations, associations and political organizations to partner and do their part. With the entirety of the Bahamian community working together, we can ensure the successful future of our county.” The public is urged to take part in The Campaign for the Bahamas by “getting informed” and “getting involved.” The first step is to visit the website, www.campaign242.org, to learn more about the issues and specific actions that can be taken to play an active part in fixing them. Read the client’s press release.